Vampires have been incorporated in numerous stories, movies and games. They are portrayed as both good and bad. 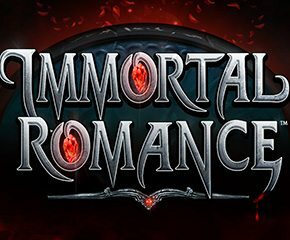 Immortal Romance is based on the love of a vampire and some spine-chilling elements. Microgaming which is one of the favourite game developers of both seasoned and amateur players. Their games have some novel and engrossing ingredients in one or the other way. Immortal Romance slots game has a total of five reels and 243 ways to win. The game is a great treat to the thrill seekers as it has a plenty of dark and exciting features waiting to be uncovered. The betting range starts from £0.30 per spin and goes up to £300. The symbols in the game are Michael, Amber, Sarah, Troy, a mansion, a manuscript and the commonly found symbols furbished to match the overall theme. The slot game is equipped with both the wild and the scatter symbols. The Immortal Romance logo and the lion head door knocker are the wild and the scatter symbol respectively. This is the prime bonus feature and it involves all the four main characters. • Amber – Players can get ten free spins along with a 5x multiplier. • Troy – Players can get up to fifteen free spins and the Vampire Bats feature will be activated. Vampire Bats feature causes a group of bats to swarm around the symbols and turns them into multipliers. • Michael – Players can get up to 20 free spins with Rolling Reels feature that causes the symbols to change into other symbols if a winning combination is formed. Also, the multiplier will increase by 1x and goes till 5x for consecutively in the event of a winning combination. • Sarah – Players can get up to twenty-five free spins attached with Wild Wine feature. The wild Vine symbol could change the normal symbols into wild symbols. However, the characters will be unlocked one after the other based on the number of times the player has activated this bonus feature. The speciality about this feature is that the player does not have to perform any actions such as landing a particular set of symbols and so on. During the gameplay, this feature will be triggered automatically, and it will convert all the five reels into wild. 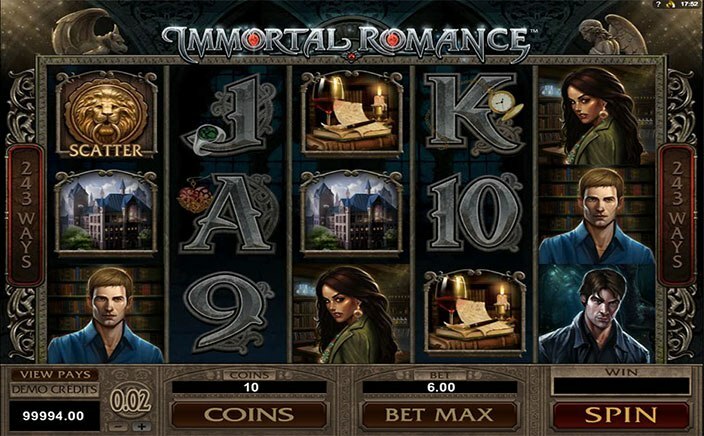 Immortal Romance tops in all the crucial elements that are essential to for a slot game to be wonderful. Since the payline is also fixed, players can focus their concentration on the gameplay and have fun.